Spiritual discernment (wisdom) comes from knowing Jesus Christ. Those who have spiritual discernment have a heart for God, a biblical worldview that comes from reading God’s Word, and a love for Truth. Those who are spiritually discerning have no trouble recognizing false doctrine and those who teach it. 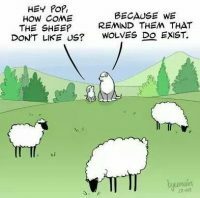 Those who are spiritually discerning know exactly what has to be done when they encounter wolves in sheep’s clothing — they are to expose them, they are to turn from them, and most importantly, they are to warn the sheep about the wolves. In 2016 Bible study author, speaker and blogger Michelle Lesley addressed the barrage of criticism leveled at those of us who are involved in online discernment ministries. One of the enemy’s favorite fiery darts is the Don’t judge lest ye be judged dart. And then he pulls the cruel You’re unloving dart from his quiver. Bing! Right between the eyes. Our wily enemy is fully aware that getting accused of being judgmental and unloving (mean and divisive) can shut a person down. Recently, I’ve been thinking a lot about the phrase “speaking the truth in love” from Ephesians 4:15 as it pertains to speaking and writing about false doctrine and false teachers. Many Christian women have the mistaken idea that “speaking the truth in love” equates to being “nice.” We’re always smilingly sweet and never say anything that might hurt someone’s feelings or could rock the boat at church. Are we to be kind? Yes. Are we to do our best not to hurt others? Of course. Should we be making waves over every little thing that rubs us the wrong way? Absolutely not. We are to deny ourselves, setting aside our personal preferences and, in many cases, even our own rights, to the point of laying down our lives for others. But we need to understand the distinction between personal preferences and biblical doctrine. And that’s where I think a lot of people get confused. We die to personal preferences. We die for the purity of biblical doctrine. The enemy is stealthily infiltrating and conquering church after church with false doctrine. We are at war. And that’s going to mean ruffling feathers, rocking the boat, and hurting feelings sometimes. Because the full armor of God doesn’t come with a white flag or a pen for signing peace treaties.